On a sunny Sunday October morning, Siarra and Aaron celebrated their love with an adventure-themed wedding. They exchanged their own personal vows under the trees in front of a handful of their closest friends and family. What followed was a brunch reception with all the elements of an epic breakfast: made-to-order waffles, a custom coffee bar from Event Espresso, a doughnut wall, mimosas and a biscuit bar. This couple incorporate their love of travel into the wedding wherever they could, including using colorful paper airplanes for guests to toss after their ceremony and paper flowers made from maps. The couple’s custom designed invitation suite also inspired a feeling of wanderlust. A bluegrass band serenaded guests as they played outdoor games like corn hole, Connect Four, Jenga and Checkers. Siarra’s lace gown with a greenery halo paired perfectly with Aaron’s cap, map bowtie (of course!) 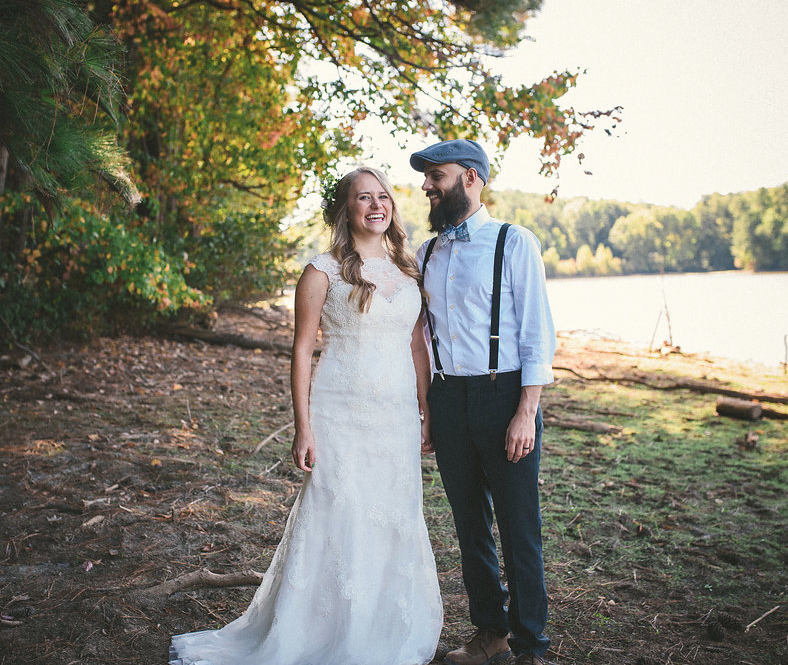 and suspenders in this outdoor Raleigh wedding, perfectly captured by Three Region Photography.